Chicken tenders are perfect for a quick meal or as a snack. Kids love ’em too! You can purchase boneless skinless chicken breast tenderloins at most grocery stores and work directly with those. 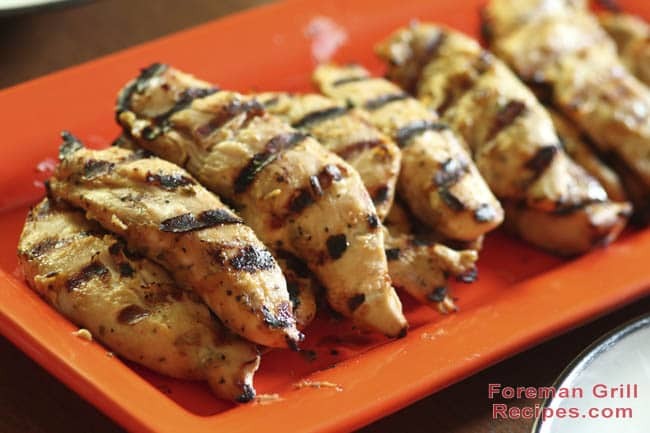 Or you can use regular boneless skinless chicken breasts and gut them into strips of approximately 1 inch wide. If starting with whole breasts, use a meat mallet and pound to a thickness of about 1/2 inch. They will grill much better that way. Mix salad dressing, lime juice and honey in a shallow bowl of ziploc bag and add chicken tenders. Marinate for as long as you can. If you can let them marinate overnight they will be best. But even for a few minutes and you’ll still get tasty tenders. Preheat your grill for at least 5 minutes with the lid closed. Use high setting if you have it. Add marinated tenderloins and close lid. Grilling time will be approximately 5 minutes. Be sure to check for doneness and internal temperature of 165F.